What can I say to those of you who are contemplating voting for Proposition 34 and believing that this is how we should end the death penalty? While I am one who thinks the death penalty never should have been legal in the first place and should have ended decades ago, I pause at the thought of ending it now in California at the expense of hundreds of people who are wrongfully incarcerated who would effectively have their habeas rights for appeal terminated. Habeas corpus allows inmates to challenge their convictions or sentence for reasons outside the trial record – typically, incompetent legal representation, misconduct by a judge or juror, or newly discovered evidence. Such challenges are reviewed by both state and federal courts. While I am one who thinks the death penalty never should have been legal in the first place and should have ended decades ago, I pause at the thought of ending it now in California at the expense of hundreds of people who are wrongfully incarcerated who would effectively have their habeas rights for appeal terminated. I am a factually innocent man who has been denied the appointment of habeas counsel by the state Supreme Court for 16 years now. I have been denied any assistance through the years by reputable agencies like the Habeas Corpus Resource Center (HCRC), California Appellate Project, ACLU, the Innocence Project and countless other California attorneys who all agree that my state and federal constitutional due process rights have been violated but have refused to step up and help. These are the very agencies that the author of Proposition 34, former San Quentin Warden Jeanne Woodford, claimed will be the safeguard against locking innocent people up for the rest of their lives without the possibility of parole. They are her answer to what people should do who are innocent and will have their appeals gutted by the new law. If Proposition 34 passes, it will endorse everything that is wrong with the criminal justice system and allow the appeals of innocent people on death row to go unheard. It will take away the one guarantee, through habeas counsel, that death row prisoners have to be able to clear their names and prove their innocence. There is evidence that approximately three dozen people who have arrived on death row one to four years after me have received an appointment of habeas counsel. Now Jeanne Woodford, who has four executions under her belt, has worked in collusion with other supposed anti-death penalty advocates to draft Proposition 34 and retroactively terminate the habeas appeals of people like myself who have not yet received the due process from the state to which I am entitled as a death row prisoner. Jeanne Woodford seeks to take this right away from hundreds of prisoners. What is even more horrifying is that she openly admits that there are innocent people on death row, that there have been cases where district attorneys and police investigators have falsified evidence or used coercive tactics to get convictions and that none of them will ever be held accountable for their actions. Nationally there are over 2,000 people who through the writ of habeas corpus have proved their factual innocence and cleared their names. Over 300 of these cases have been capital ones. How can anyone in good conscience be willing to terminate this vital appeals process and make it almost impossible for those falsely convicted to prove their innocence? Vote No on Prop 34; do not destroy due process rights. In my own case I have recently discovered through my own legal research that my case was actually dismissed on March 13, 1995, and I was ordered to be released from jail. Instead of being released I was held in custody against the order of the court to dismiss the charges. No criminal charges were legally re-filed and this truth has been buried for 18 years. Not one attorney I have been appointed by the state has acted on this information and the only way I will be able to get justice on this issue is to have a habeas counsel who will raise this in court as part of the appeals. Feel free to contact me with any feedback or questions or if you would like to have me participate in a “Live from Death Row” event. 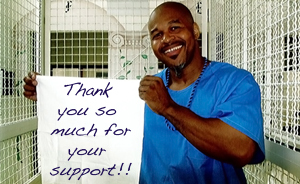 Send our brother some love and light: Darrell Lomax, K-27402, 4EY27, San Quentin State Prison, San Quentin, CA 94974. Next articleKPFA subscribers, be sure to vote for a Local Station Board that represents you!